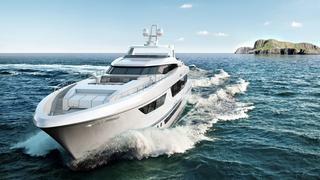 Dutch shipyard Heesen is to unveil its new superyacht Project Nina at the 2015 Fort Lauderdale International Boat Show in Florida tomorrow (November 6). The 38-metre semi-displacement, aluminium-hulled yacht has had both the exterior and interior designed by Milan-based studio Hot Lab, with Heesen’s in-house engineering team taking care of the naval architecture. Nina builds on the success of her semi-displacement sisters in the same size range, while emitting her own individuality. There is a strong line running from the bow all the way aft connecting to the upper deck, creating a clear separation of the interior spaces below and the open exterior areas above. Heesen said that Hot Lab had created a stylish and contemporary design allied to the classic look that the Dutch shipyard is renowned for. The designers have maximised window space and open air deck areas. The upper deck aft has also been extended to create room for a six metre tender. The wide and open exterior areas are complemented by elegant interiors where guests are treated to large social and accommodation spaces served by an abundance of natural light. Nina can accommodate up to 10 guests in total, in a full beam (eight metres) master suite and a further four guest cabins on the lower deck, all with en-suite. The vessel’s wide beam allows for enough interior space for separate guest areas and crew quarters, as well as allowing the crew to move easily through the yacht. Nina is powered by two MTU 2000 M96L engines developing 1,939kW each that give her a top speed of 23 knots. Humphree active interceptors will be installed to provide the smoothest ride possible for the conditions.